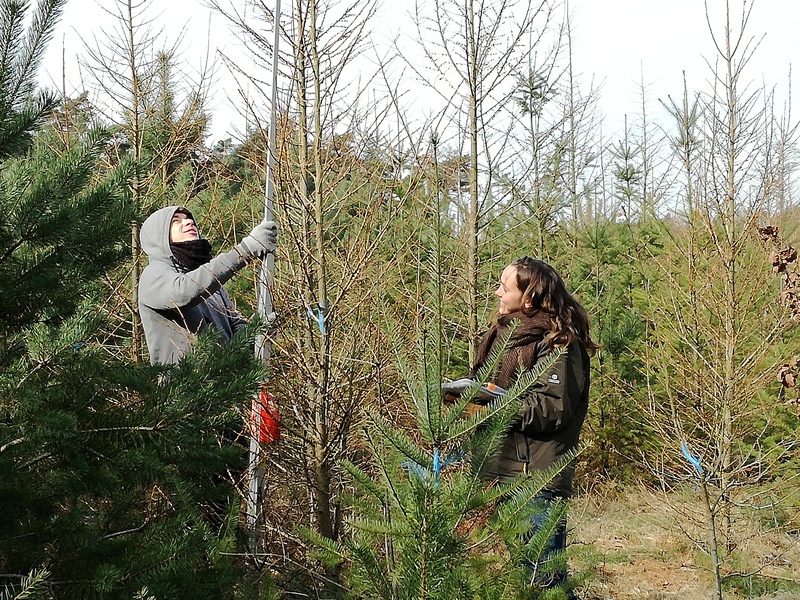 FORBIO is an innovative, large-scale forest biodiversity experiment established in Belgium between 2009 and 2012. The acronym stands for assessment of the effects of tree species diversity on FORest BIOdiversity and ecosystem functioning. At three sites with contrasting site conditions, plots were planted with one up to four tree species. Various aspects of ecosystem functioning will be compared between plots that differ in tree species richness but have developed under the same abiotic conditions. 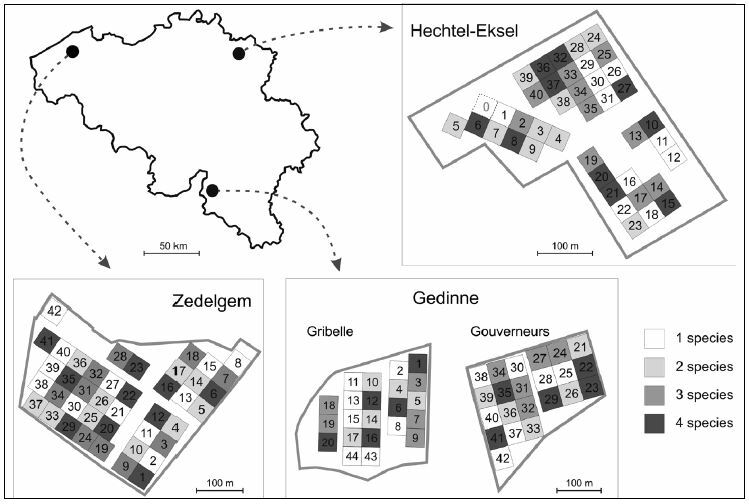 The sites are located in Gedinne (Gribelle, Gouverneurs), Hechtel-Eksel and Zedelgem. The basic experimental design is the same for each study site and follows a classical synthetic community approach. 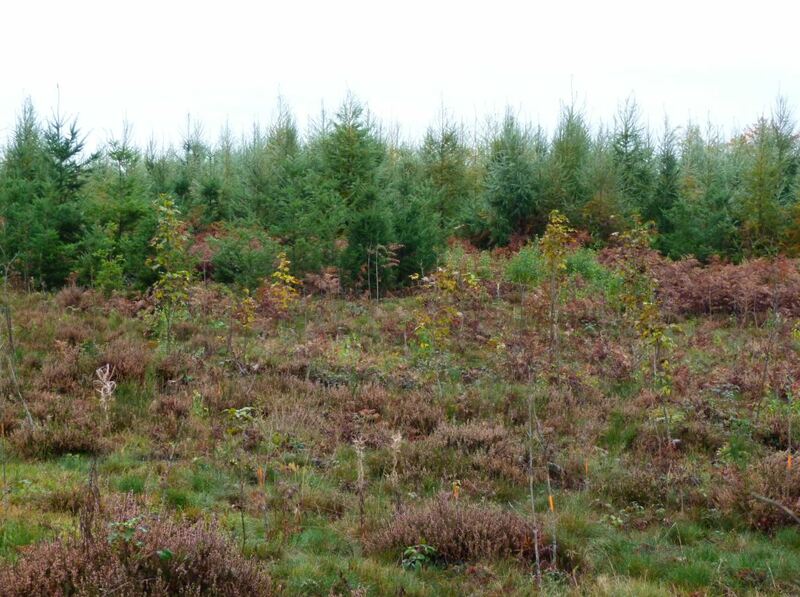 Monocultures and mixtures of two up to four tree species were planted on an environmentally homogeneous site. All species combinations occur, and there is one (blocked) replication. Each study site has 40 plots, i.e., 5 plots for each of the four diversity levels (1, 2, 3, and 4 species) and two replications. Yet, the overall number of plots in the FORBIO experiment is 127 instead of 120. At the Hechtel-Eksel site, one extra plot is left for spontaneous succession. At the Zedelgem and Gedinne sites, different provenances of oak (Zedelgem) and beech (Gedinne) were used as an extra treatment; two additional monocultures with the extra provenances were added in Zedelgem and four in Gedinne. Trees were planted on a 1.5 m x 1.5 m grid. In mixed plots, individual species were randomly assigned to homogenous groups of 3 x 3 trees. Five site-adapted but functionally dissimilar species were planted per site. Each species occurs in a similar frequency, i.e., in 20 of the 40 plots, and the two-species combinations occur in similar frequencies as well (10/40). 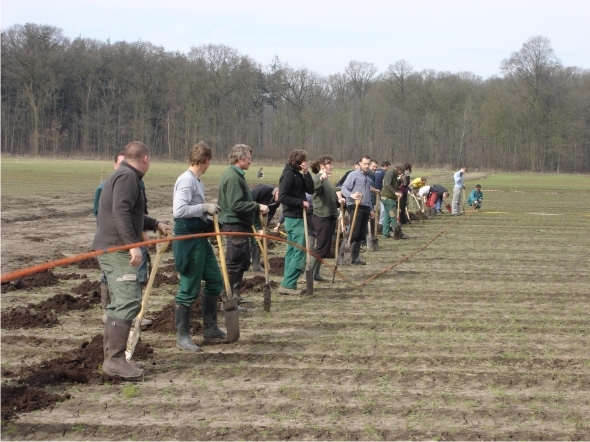 An extensive soil survey prior to the planting enabled attributing treatments and replications to the experimental plots in such a way that there is no covariation between any of the soil variables and the presence/absence of a tree species or the diversity treatments, a major strength of the FORBIO experiment. The overall species pool consists of broadleaved as well as coniferous tree species that are particularly relevant for forestry in Belgium. The species differ in, e.g., root characteristics, temporal growth dynamics, and shade tolerance. 1, 2, 3, 4 sp. 1, 3 provenances (Fagus) 1, 2, 3, 4 sp. 1, 2, 3, 4 sp. Monitoring of ecosystem functioning started shortly after planting. Multiple processes are being measured, ranging from tree growth and tree quality development over element cycling to associated biodiversity dynamics. As the trees grow older, we plan to add more processes, e.g., water cycling, to the monitoring scheme so that the picture of ecosystem functioning in the different treatments will be as complete as possible. We try to assure that measurements are performed in all the plots, in order to include the full range of treatments, sites and processes in the analyses.